Linfield students Mitra Haeri '14, Justin Frederick '16, Jacob DeVore '15, Shaterah Hall '15, Ryan Morgan '17, BrieA'nna Battle '16, Camille Weber '16, Kuzi Rusere '17, Mic Cooney '16, Kaitlynn Cantu '17, Kinsey Lloyd-Coles '15, Sammi Hilton '15, Darrahlyn Young '16, and Mackenzie Larson '16 celebrate reading at Nicholson Library during the summer of 2014. 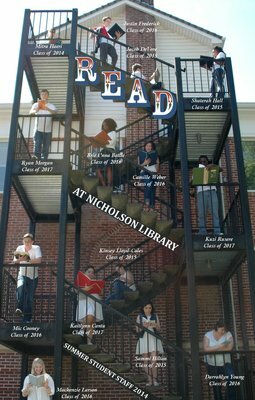 Terry, Paula and Nicholson Library Staff, "2014 Summer Student Staff READ Poster" (2014). READ Poster Gallery. Image. Submission 138.